This is an urgent request for anyone employed as a Research Assistant, (whether or not you also hold another position). If you are employed as a Research Assistant, or have been in the past year, we need your assistance immediately to help ensure that RAs are afforded the right to join a union. We are very sorry for the short notice of this request, but it was unavoidable, due to very late-breaking information regarding the status and nature of our upcoming hearings. This coming Wednesday, September 12th, we are back at the Labour Board after a long hiatus, due in part to employer cancellations of meetings, followed by sessions on the 14th and 17th, and we will likely continue into October. ... actually attending a hearing date (above) and briefly giving verbal testimony regarding the questions above pertaining to the nature of RA employment. We are able to offer a small per diem for costs incurred (of approximately $40) for your time. ... any documentation regarding RA employment, such as contracts, communications of tasks to be performed, examples of work products, etc. ... the names and contacts of students you know taht are employed currently as RAs. ... the names of faculty supervising RAs. Last year nearly 350 RAs signed cards requesting the right to join CUPE, and hundreds more have done so during the past three drives in 1975, 1981 and 1999-2000. RAs at other some Canadian universities already have this right, often voluntarily recognized by the employer. This drive is especially important in the context of recent graduate enrolment growth, which has been accompanied by a reduction in the proportion of unionized GAships available to our members. The unionization of RAs would also likely free up TAships that could be held by our contract faculty Unit 2 members, who have also suffered job losses in the past year due to enrolment growth. Finally, it is important to note that YUFA (representing faculty) and the GSA supported the drive. I can be reached at my cell at 416-577-3903 or at jpayne3903@yorku.ca if you have any questions or can provide any of the above forms of support. York University plans to merge two of its largest faculties over the next two years, pending approval by the Board of Governors. On April 26, following a lively debate, the York University senate voted to approve a restructuring plan endorsed by its Academic Policy and Planning Committee (APPC) that calls for the establishment of a new faculty. This faculty will encompass all the units and programs in the faculty of arts and in the Atkinson faculty of liberal and professional studies - effectively merging the two faculties. The restructuring plan is projected to be complete by September 2009. "It would be unprecedented for (the board) to go against a recommendation from senate on something like this," said Matthew Hayes, a board member. "I doubt very much that the board is going to nix it." During a speech in the senate, York's president Lorna Marsden was in favour of the restructuring plan, insisting that "change is going to occur." APPC's plan now goes to the Academic Resources Committee (ARC) on the Board of Governors, who will meet on June 5. Harriet Lewis, university secretary and general counsel, expects ARC to forward the plan to the board for their June 25 meeting. "The plan and the hope is that it will go forward to the next meeting," Lewis said. "That's the anticipated time frame." In a speech in senate, Ian Greene, master of McLaughlin College, spoke to the fact that the restructuring will "remove artificial barriers" that have been inhibiting students from taking courses across faculties. "Currently if you're a student in the Atkinson faculty, and you want to take an elective course somewhere in the faculty of arts, it may be almost impossible to get in," he stated in a later interview. "There are limits put on the seats in the faculty of arts courses. That means that preference has to be given to the faculty of arts students and students in particular programs." But not everyone is in favour of overall academic restructuring. The Canadian Union of Public Employees (CUPE) local 3903, representing contract faculty at York, have been arguing that job cuts are occurring due to ongoing restructuring. While they are not commenting directly on the APPC plan, CUPE 3903's Political Action and Research Committee called for strike action to be implemented if their concerns about contract faculty job losses to incoming masters students are not addressed. "This ongoing restructuring of York University has a direct affect on the quality of education for its students," stated CUPE 3903 member Mike Ma. "The quality of education at York U has begun a downward spiral to a depth from which it may never recover." Robert Drummond, dean of arts, argued that the restructuring plan will be given sufficient time to be considered and implemented. "The proposal will take at least another two years to be implemented, so there will be lots of opportunity to address issues of detail," he stated. There have also been concerns that Atkinson will be swallowed up by arts, or that the merging of units and programs is akin to a "forced marriage" that is doomed to failure. "I understand the concerns of small units being merged with large units," said Drummond. "But I believe the arts chairs have signalled their openness to a process that respects the academic judgment of their colleagues in Atkinson." Vice-President Academic Sheila Embleton, Dean of Arts Robert Drummond and Dean of Atkinson Rhonda Lenton prepared a report to senate in January entitled Restructuring Options on the Keele Campus: The Way Forward. This report, endorsed by the APPC at the time, called for "the creation of two new faculties, one centred around the humanities and social sciences and one around programming in policy studies, information systems and management." On March 22, however, after extensive consultation, the APPC withdrew its motion to senate to establish two new faculties and instead presented a statutory motion to create a single new faculty. The office of the vice president academic has faculty restructuring documents online dating back to September. CUPE 3903 Counter Proposal to Job Cuts. The following document sets out a series of proposals to mitigate the impact of the shift in the distribution of tutor positions from CUPE unit 2 to CUPE unit 1 per article 3.02.4 of the CUPE 3903 Unit 2 collective agreement. Please be advised that in presenting these proposals, the Union is in no way indicating it agrees with the proposed alteration to the distribution of tutor positions amongst the bargaining units. We remain steadfastly opposed to the changes the York Administration has proposed and our campaign to oppose the job cuts will continue. Our view is that members of CUPE Unit 2 are the foundation on which York has provided an excellent undergraduate learning environment and that your planned actions denigrate their contribution. i) In the context that the employer presented their maximum number of positions shifted in each hiring unit at the April 5th LMC, the employer immediately contact the relevant hiring units and ask that they post no more than the predicted maximum number of additional tutor positions in CUPE unit 1. As an example, the Division of Social Science will not post any more than the number of additional tutor positons in CUPE Unit 1 reported in the April 5th, 2007 LMC (which the employer reported is roughly one third of tutor positons posted in 2006). We need to emphasize that in our view, not agreeing to this is a gross violation of articles 11 and 12 of the CUPE 3903 Unit 2 collective agreement. To post all the tutor positions in CUPE Unit 1 is an exercise of your management rights which is unreasonable and in bad faith. We further propose that decisions on making appointments to the additional tutor positions in CUPE Unit 1 be completed by no later than May 21st and that any unfilled positions be re-posted into CUPE Unit 2 no later than May 22nd (which is already fully one month after the common posting date). The timelines set out Article 11 and Article 12 stipulates that the employer take the steps necessary to plan the job offering in EACH bargaining unit concurrently. Our view is that our proposal is no more than what is clearly expected in the collective agreement. The unpredictability of contract work for those in CUPE unit 2 is a difficult fact of their work life. The timelines that the employer has agreed to Articles 11 and 12 is an important aspect of the collective agreement which the Union strongly holds because it minimizes that unpredictability. ii) The Union propose that the employer agree in writing that the maximum number of tutor positions shifted in each faculty be no greater than the number of positions needed to satisfy the priority pool entitlement for the additional doctoral student intake for 2007 which was reported to the April 5 LMC. We further propose that the employer commit to providing a thorough and accurate reporting of the above within a reasonable timeframe to be negotiated by the parties. a) the York Administration agree to an expedited appointments process. What we propose is that at a minimum, the timelines set out for appointments be strictly adhered to and that the York Administration provide the necessary resources to aid each hiring unit in adhering to the timeline for appointments. b) the York Administration agree to an expedited grievance/arbitration process for appointment grievances for Fall/Winter 2007-08. That expedited process would include but not be limited to agreeing to reasonable requests to by-pass steps in the grievance process, reducing the written reply time by one-half in each step of the grievance process, and cooperating with any request from the Union for expedited arbitration. c) the York Administration send a memo to instruct all merged hiring units (for example Psychology in the Faculty of Health) that the Union be duly notified in the case where qualifications for positions will be enhanced. We further propose that the memo communicate the neccessity for all qualifications to strictly adhere to the test of reasonableness and demonstrable relevance set out in article 11.01.3.
v) the York administration agree to extend the commitment to scheduling flexibility set out in article 12.22 (i) to conflicts for positions accepted outside of the University for any persons who can demonstrate that proposed shift in the distribution of tutor 1 positions has impacted them. Our view is that at a minimum the above proposals be substantively agreed to as a gesture toward the dignity and respect our members deserve. What we can guarantee is that unless we get substantive agreement on the following proposals, our campaign to stop the job cuts in CUPE unit 2 this year and going forward into bargaining next year will be even more concerted. The new salary disclosures for 2006 were just published this afternoon. Most professors made a few thousand more this year. Some profs made $10,000 more than last year. President Marsden only made $4,000 more this year than last. It hurts when you call me professor. They’re paid like fast-food workers. Last week's roundtables were a great success! About twenty people came out to the meetings and we had very good discussions. Since we were all very disturbed by the admin's designs to cut jobs we shared many thoughts and opinions about what to do. To hear our discussion, just email me and I'll send you the link to the roundtable recording. Although this is a great start we can greatly benefit from more committee members. If you are interested in helping out, please don't be shy. Contribute as much or as little time as you can afford. The committee work is not onerous and can be very rewarding. Just contact me. March 27 & March 28 at 12:30 in S167 Ross (beside the grad lounge). Updates and discussion. Lunch is provided! With your help we can stop or mitigate these planned cuts! 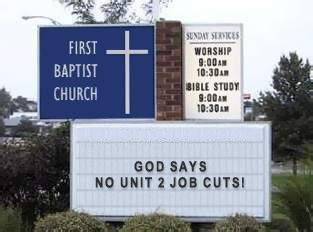 Job Cuts coming to a department near you!!! Last year, the administration first notified CUPE local 3903 that they had devised a plan to "shift existing contract faculty jobs to incoming Master's students. As the union representing contract faculty, teaching assistants, and graduate assistants, CUPE was deeply concerned that this job shift was effectively going to terminate hundreds of tutorial leaders--many of whom have years of extensive teaching experience. If it goes through the proposed job cuts to CUPE 3903 contract faculty could affect 500 tutor jobs. As these jobs are given to incoming graduate students, many of whom will be at the Master's level, those who gave years of service to the university will be effectively terminated without any regard for their livelihood or well-being. Currently, Unit 2 tutorial leaders represent more than a fifth of the total number of tutorships at York, and are some of York's most experienced and valuable tutors. Besides being a terrible way to maintain relations with the workforce,the termination of experienced tutorial leaders will also be seriously detrimental to the quality of undergraduate education at York. For example, a contract faculty may have many years of experience teaching a tutorial, may have prepared many valuable lesson plans, or may have a specific academic background that enhances the learning enviroment of the tutorial. All these qualities will be lost when these contract faculty tutorial leaders are terminated. Why? Because the administration wants to increase graduate enrollment for next year and they are targeting Master's enrollment. The administration is aiming to increase Master's enrolment by 530 to meet their Multi Year Agreement targets with the province. All universities in Ontario have signed onto multi-year accountability agreements that cover a three year period between 2006-2009. And if universities meet these targets, then they are awarded extra money from the province. In addition to receiving extra money for meeting these targets, the administration wants to save money by offering these jobs to incoming master's students as their teaching assistantship funding. And they will save money. They will save money because half the money that the university pays out to the graduate student TA will come back to the university in the form of the tuition that that graduate students pays back! So, it is cheaper to pay the incoming master's student than it is to maintain a more experienced and track-proven contract faculty tutorial leader. In the eyes of the administration, the contract faculty costs more. Even though each Master's student is worth $21,000 in provincial grants and university tuition fees, the administration is looking to squeeze even more money out of them. If they get them to be tutorial leaders, then half their salary that the university pays out can come back to the university in the form of tuition. And, as a financial side benefit, existing contract faculty can then be terminated. The university can get new money while simultaneously saving money through job cutting. It is a devious plan. In most departments, Masters students do not currently teach for their funding, both because of academic standards for tutorial jobs in the hiring units, and because graduate programmes recognise the importance of funding Masters students in ways that allow them to concentrate on their own work. With the administration's proposed plan the added pressure that leading and teaching tutorial groups will put on incoming master's is considerable. The extra pressure of being first time teachers will have a negative affect on their time to completion. But this issue does not just affect contract faculty and the incoming master's students. As well as affecting Unit 2 contract faculty and incoming master's students, this issue is also of great concern for Unit 1 PhDs, especially those in the latter years of their study. If these jobs are successfully shifted to incoming master's students, then the future opportunity for upper year PhD. 's to take on Unit 2 tutorial work may be closed off. For example, many PhD candidates who drop down to part-time status after their 6th year will no longer have the option to apply for Unit 2 tutorial work. With the administration's new plan to fund incoming master's students this option will no longer exist. This will have a significant effect on the informal 7th year funding currently available to PhD candidates (note: 6 years of funding is typically given to PhD's). PhD students who are currently Unit 2 contract faculty and finishing their doctoral work may no longer have paid employment, potentially extending their time to complete their degrees. CUPE 3903 has urged the administration to review this shortsighted plan and work with CUPE3903 to devise a better plan to fund graduate student growth in a way that will not harm the livelihood of contract faculty or the quality of graduate and undergraduate education. However, the administration has be reticient to collaborate or share their plans. They are approaching this matter in a very secret and un-consultative manner. Since the beginning of this academic year, the administration has informed CUPE3903 only twice of its plans. The first was in November 2007 where Brian Abner (Associate Vice President, Academic Resource Planning) informed the union that they would like to grow the intake of Master's students by 530. However, none of the details regarding the plan to increase graduate enrollement nor the shifting of jobs was provided. This is critical information because when dealing with proposals to drastically enlarge graduate population and severely diminish contract faculty positions "the devil is in the details." The second meeting was in March 2007 where Barry Miller (Executive Director, Empolyee Relations) informed CUPE 3903 that the administration still did not know much more than it did in the previous year. Although major decisions were to be made concerning the termination of hundreds of contract faculty, Barry Miller simply stated that such details were still not available and that decisions were only half made and being further studied. During the last Senate meeting, February 2007, four different Senators pressed the president to disclose and discuss the re-structuring plans. Speaking on behalf of an absent president, Sheila Embleton (Vice-President, Academic) stated that these were "appropriate" questions but that she would get back to these Senators at the next Senate meeting. It was appalling that the administrator in charge of academic planning could so easily shrug off and defer an issue of such mammoth importance to the next meeting. Such secrecy and anti-consultative behavior with legitimate stakeholders (i.e. Senators) is cause for alarm. In response to the York administration's tactics of delay and stone-walling CUPE 3903 has taken it upon themselves to begin a campaign against these job cuts! An online petition (http://www.petitiononline.com/CUPE3903/petition.html) is available for people to read and sign and a blog (http://cupe3903.blogspot.com/) has been created where visitors can view video testimonials explaining the deep and personal impact of such job cuts. In the coming weeks, much will be decided as various departments will be sending out letters of acceptance to Master's student applicants. These letters will detail the funding structure under which these Master's students are accepted. Will the administration reach their desired target of 530 new Master's students? Will the province reward the university with the promised funds? Will these master's students be given jobs as tutorial leaders? Will hundreds of contract faculty be terminated? Will the quality of education at York university be further degraded? Stay tuned. The Union Strikes Back! Puppet Show performed in front a live audience of kids! Enda expresses his disappointment in losing his job. Nadia explains how job cuts are already happening! Flushed Away after years of Work!